POCATELLO, Idaho — Federal authorities have confirmed that a cyanide trap intended to kill coyotes in eastern Idaho instead killed a dog in an incident that local law enforcement officials say also injured a 14-year-old boy. The U.S. Department of Agriculture acknowledged Friday that workers with its Animal and Plant Health Inspection Service's Wildlife Services placed the device called an M-44. The device activated and killed a 3-year-old Lab named Casey on Thursday near Pocatello. "APHIS' Wildlife Services confirms the unintentional lethal take of a dog in Idaho," the agency said in an emailed statement to The Associated Press. "Wildlife Services has removed M-44s in that immediate area." It's not clear how many other devices had been set. Bannock County Sheriff Lorin Nielsen in a statement said the boy's father reported that his son had been covered in an unknown substance and the dog had died. "Initially, we were just trying to determine what it even was — that was our biggest concern" said Capt. Dan Argyle, who responded to the call at about 1 p.m. Thursday. "We have never dealt with these before." He said the device was on top of a ridge about 500 yards from the boy's home, which is in a foothills area with other homes outside Pocatello. "It's a miracle the child wasn't seriously injured or even killed," Argyle said. M-44s are spring-activated devices typically smeared with bait that shoot poison into an animal's mouth when it tugs on the trap. The federal government uses the devices to control predator populations in an effort to limit losses to livestock operators. Theresa Mansfield, the boy's mother, said her son was walking their dog on a hillside behind their home when they encountered the device. She said her son was knocked down when it activated, and that he watched as the dog died. "Seeing something like that stays with you," she told the Idaho State Journal (http://bit.ly/2mCFmGu). "Wildlife Services is completing a thorough review of the circumstances of this incident, and will work to review our operating procedures to determine whether improvements can be made to reduce the likelihood of similar occurrences happening in the future," the Agriculture Department said in the statement. A 14-year-old boy was hospitalized and his dog killed when he picked up a government-planted, cyanide-filled 'bomb' near his Idaho home, causing it to spray them both with the toxic substance. Canyon Mansfield, 14, was playing with his yellow Labrador retriever, Casey, near their home east of Pocatello Thursday afternoon when he bent to pick up what he thought was a sprinkler head on the ground, causing it to go off. The boy - who was sprayed in the face, and continues to undergo toxicity tests - says he didn't realize at first what was happening to his best friend. 'He just stayed on the ground mumbling,' Canyon told the Idaho State Journal. 'I thought he was playing with his toy, but I saw the toy a couple yards away from him... So, I called him again and got really scared. The boy's father, Pocatello physician Mark Mansfield, rushed to the scene and pounded on the 90-pound dog's chest in a futile effort to revive the animal. Both the family and first-responders underwent decontamination procedures, and Canyon was tested for cyanide poisoning at a hospital for the second time Friday, officials and family members said. He must now undergo daily check-ups to monitor his toxicity levels. 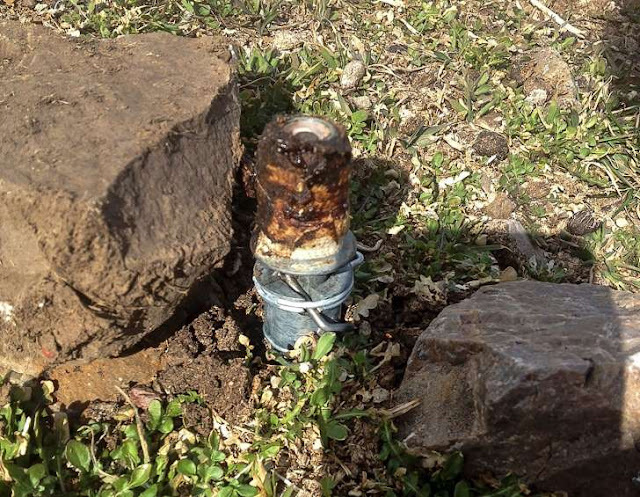 It later emerged that the M-44 bomb had been placed near the home by Wildlife Services, an arm of the US Department of Agriculture (USDA), which is targeting coyotes in the area. M-44s are loaded with 0.9 grams of sodium cyanide and covered in smelly bait, in the hope of attracting animals. When something triggers the 5-7-inch tubes, a spring-loaded trap sprays the cyanide into the face of whatever is nearby. Under USDA guidelines, signs must be placed around the location of the traps in both English and Spanish to avoid accidents from occurring. Bannock County Sheriff Lorin Nielsen also said that there were no obvious warning signs, although the case is still under investigation. The agency has been sued by conservation groups claiming that its programs to poison, trap and shoot various predator species violate federal environmental and wildlife protection laws. Thursday's incident marked the first 'unintentional lethal take of a dog' by an M-44 in Idaho since 2014, and Wildlife Services seeks to minimize hazards to pets and humans by posting warnings, spokesman Andre Bell said. 'These devices are only set at the request of and with permission from property owners or managers,' the agency said. They are 'spring-activated' and 'not explosive devices,' it said. Posting on Facebook, Canyon's sister Madison took issue with the department's claims. 'The USDA's statement regarding the horrific incident that happened to my family yesterday is both disrespectful and inaccurate,' she wrote. 'The USDA intentionally refers to the brutal killing of our dog as a "take" to render his death trivial and insignificant. They also claim that the killing of an unintended victim is a rare occurrence, but this is entirely untrue. According to USDA statistics hosted on the anti-trapping website Predator Defense, between 2003 and 2014, 930 dogs were killed by M-44s. In that same period they killed 150,881 coyotes. Sheriff Nielsen, who described the devices as 'cyanide bombs,' also said no notice was given to authorities about their placement. 'I've been a sheriff here for 20 years and worked for the office for 39 years, and I've never heard of leaving around a device that emits poisonous gas,' he said. Theresa Mansfield said Wildlife Services had not sought to contact the family to apologize for the incident. Her husband, Pocatello physician Mark Mansfield, rushed to the scene and pounded on the dog’s chest in a futile effort to revive the animal. The family and first-responders underwent decontamination procedures and the boy, who was sprayed in the face, was tested for cyanide poisoning at a hospital for the second time Friday, officials and family members said. The device, called an M-44, was among several placed in the area by Wildlife Services, an arm of the U.S. Department of Agriculture that targets coyotes, wolves, cougars, foxes and other animals considered nuisances to farms and ranches. Thursday's incident marked the first "unintentional lethal take of a dog" by an M-44 in Idaho since 2014, and Wildlife Services seeks to minimize hazards to pets and humans by posting warnings, spokesman Andre Bell said. "These devices are only set at the request of and with permission from property owners or managers," the agency said. They are "spring-activated" and "not explosive devices," it said. Bannock County Sheriff Lorin Nielsen, who described the devices as "cyanide bombs," said no notice was given to authorities about their placement. “I’ve been a sheriff here for 20 years and worked for the office for 39 years, and I’ve never heard of leaving around a device that emits poisonous gas,” he said. 0 Response to "Federal cyanide trap injures eastern Idaho boy, kills dog"